Figure 1. 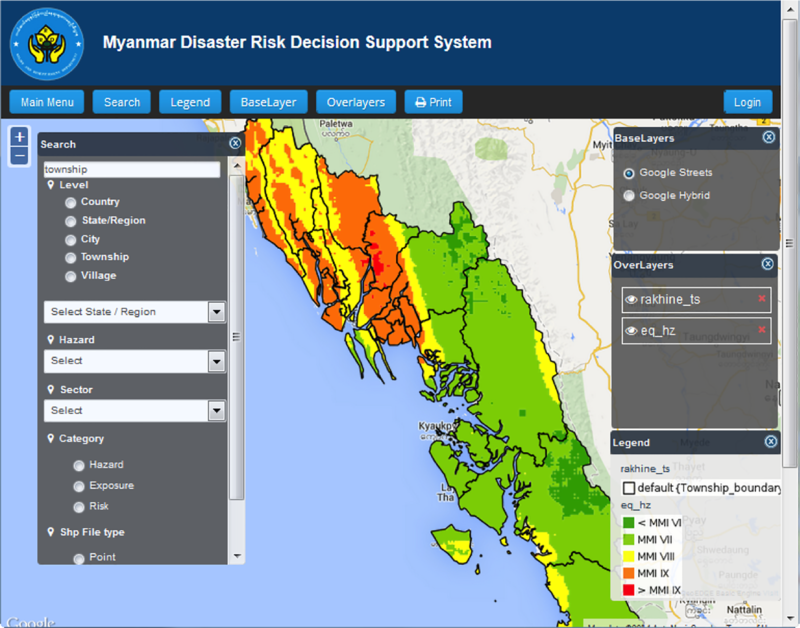 The Myanmar Disaster Risk Reduction Decision Support System has a user-friendly interface that allows decision makers and technical officials to access risk assessment data in Rakhine State. Source: ADPC 2015. Figure 2. Flood Hazard Map of Rakhine State. Source: ADPC, UNDP 2011. Figure 3. Community members walk to assess damage of recent flood events in late July and early August. Cyclone Komen triggered floods and earthquakes that affected 12 states in Myanmar. Activities such as these are important in the development of early warning systems as information is needed regarding the overall impact of past disaster events. Source: ADPC, IOM 2015. Figure 4. Tabletop exercise involving female community members and local government authority to develop Flood Early Warning System in Ayutthaya Province, Thailand. Source: ADPC 2013. Figure 5. 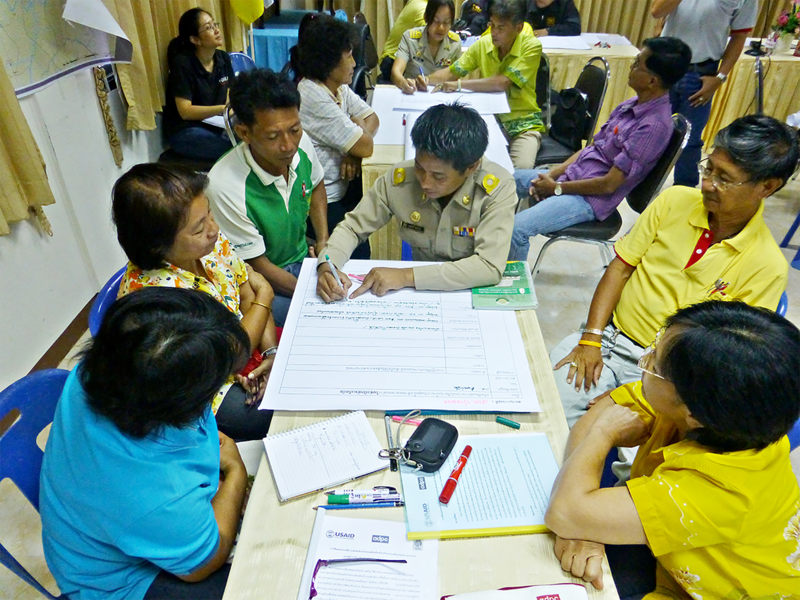 ADPC training of community members in Singburi Province of Mr. Warning System derived from disaster risk database provided by the Department of Disaster Prevention and Mitigation (DDPM). Source: ADPC 2015. Disaster Risk Management (DRM) practitioners utilize a process to understand disaster events before they occur known as a Disaster Risk Assessment (DRA). DRAs often utilize physical and historical data, scientific methods, computer models, and expert judgment to estimate the level of risk and map them for the areas of interest. Today, DRAs rely on earth observation information such as satellite images and aerial photographs, combined with scientific models that mimic natural phenomena (hydrological, geological, meteorological, or climatic events) and geographic information systems, to demarcate elements that may be at risk from future disasters and estimate potential impacts from such events. Information on disaster risk is often portrayed in a form of a map, providing visual effects for easy comprehension by non-technical users. Further, information and communication technology comes into play when disaster risk information and maps need to be digitally disseminated allowing them to reach a wider group of users (as compared to paper maps that can be limited in numbers). A web-based platform, the Myanmar Disaster Risk Decision Support System, was used to store geospatial information such as map layers pertaining to the hazard, vulnerability, and risk from disasters in the selected study area. The Myanmar Disaster Risk Decision Support System will allow disaster risk reduction practitioners, both governmental and non-governmental, to obtain information related to the areas in Rakhine State that are at-risk from various natural disaster such as floods, earthquakes, cyclones, landslides, and forest fires. It provides functionality for users to see possible impacts of those hazards to various types of physical assets as well as the people, which can facilitate disaster risk reduction activities, human and financial resources allocation, and future developmental planning within the state. See Figure 1 and Figure 2. The geographical scope of this case is Rakhine State, Myanmar, which is one of the 15 administrative divisions (states/regions/union territory) of Myanmar. Rakhine State is a coastal state located in the western part of the country, bordering the Bay of Bengal on the west and Bangladesh in the north. Being a coastal state, Rakhine has frequently been hit by natural hazards such as cyclones coming from the Bay of Bengal resulting in flash floods and riverine floods in several parts of the state. 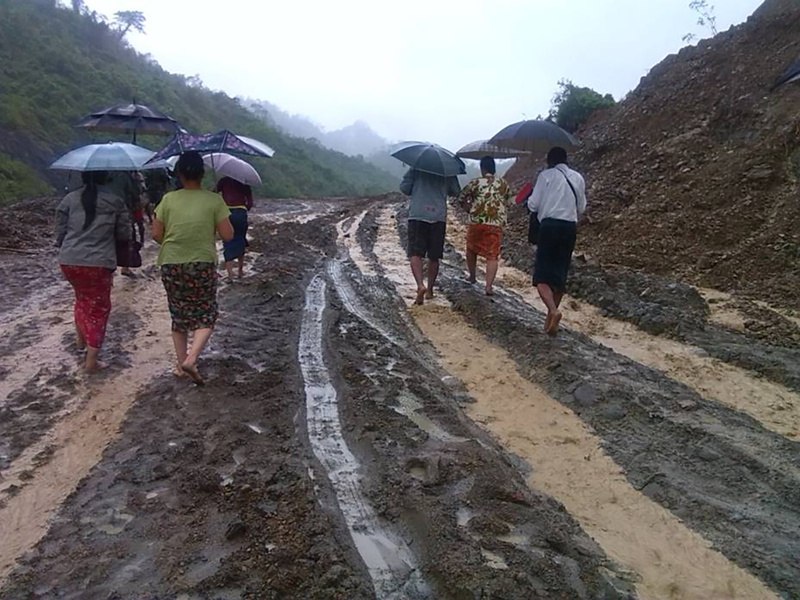 The effect from flash floods was further exacerbated from the mountainous terrain of the area. Rakhine State is home to around 3.3 million people with an average density of 100 persons per square-kilometer. The coastal area in the west is densely populated whereas the eastern hilly forest of the state is almost free from human settlements. Rakhine State receives stormy weather from the Bay of Bengal in the monsoon seasons, resulting in heavy precipitation between May and October each year. Flooding is a common threat for Rakhine. Mountains on the western part of the state often contribute to occurrences of flash floods while extreme flows from several rivers in the state caused riverine flooding almost annually. One of the worst floods in the State’s recorded history took place in July and August 2015 during the aftermath of Cyclone Komen, which also triggered devastating landslides throughout the country. The severe flood resulted in over 100 lives lost nationwide. Overall, the floods and other hazards from Cyclone Komen affected over 1.6 million (note: information obtained on 15 August 2015 and presented in Situation Report 2) people in 12 states throughout the country (NNDMC 2015) with Rakhine State as one of the most heavily affected regions. One contributing factor to the severe impact of the flood events was attributed to a lack of coordinated early warning systems throughout the state, showcasing a need for translating risk information which allows for improved programming of community based early warning systems capable of empowering the most vulnerable populations. In Rakhine State, the United Nations Development Programme (UNDP), with technical partnership of the Asian Disaster Preparedness Center (ADPC) and the Myanmar Engineering Society (MES), initiated an activity in 2011 to assess and map the risk from possible disasters in Rakhine State including flood, earthquake, tsunami, cyclone, storm surge, landslide and forest fire. While the other types of hazards are impactful for the state, this study focuses on floods. Flood hazard maps were developed based on simulations of flood depth for the 5 most flood prone river basins, in accordance with the past history of flooding. The estimated flood hazard maps indicated areas where flooding can be expected and the flood water depth wherever inundation occurs. To make the calculation, detailed hydrological, meteorological, demographic, and geomorphological data were required. Any flood mapping study starts from understanding the elevation and terrain of the river basins and surrounding areas. In this case, the publicly available Advanced Spaceborne Thermal Emission and Reflection Radiometer’s (ASTER) digital elevation model was used. Exact locations of the rivers in Rakhine State were traced from earth-observing satellite images and converted into a Geographic Information System (GIS) map layer. Analyzing digital terrain data, computer software transformed the drainage paths and watershed boundaries into a hydrologic data structure that represents the drainage network. This process allowed users to visualize spatial information, document watershed characteristics, perform spatial analysis and delineate sub-basins and streams. With the base information, the extent of floods was estimated from the rainfall data for the period from 2001 to 2010 at 10 gauging stations within Rakhine State that was collected from the Department of Meteorology and Hydrology, Myanmar (DMH). 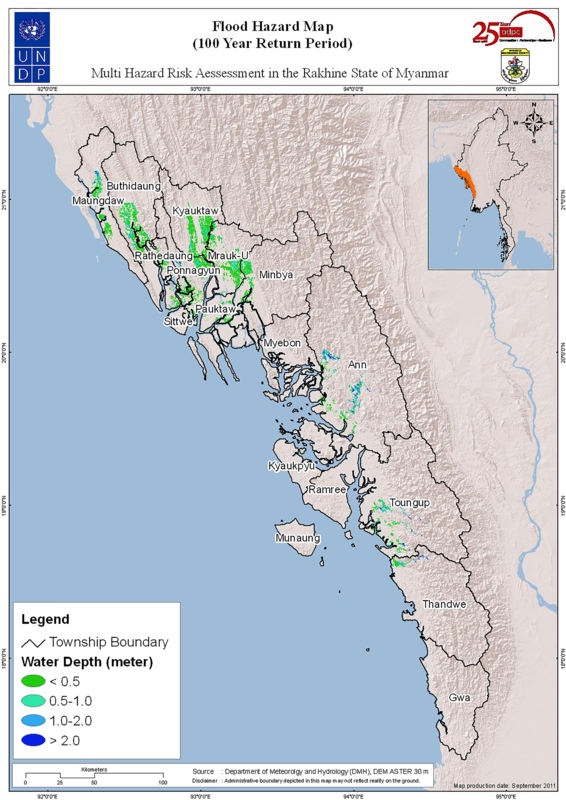 The resulting flood hazard maps of Rakhine State indicate areas where future floods can be expected. Information on the possible flood depth is also provided on the maps, which is useful for the state and national authorities to make informed decisions on flood risk mitigation activities. Examples of the applications of these maps are planning for fund and human resources allocation, for setting up early warning system, for emergency response planning, for structural and non-structural mitigation of floods, and for future development projects. The remaining discussion will focus on the use of the flood risk maps and subsequent development of a web-portal to locate areas for early warning system pilot activities. Following completion of the assessment, the information was then compiled into a “geospatial web-portal” managed by the Relief and Resettlement Department (RRD) of Myanmar. One role of the web portal is to share risk information developed at a national and state level in the country, including information from the DRA in Rakhine State. Once technical data relating to flood risk was developed into a GIS database, one of the most challenging tasks is to translate the data to non-technical stakeholders including decision makers, community groups and the private sector. Each of these groups can utilize the data to reduce their risk towards floods, storms and landslides if presented in an easy to understand and accessible format. In order to achieve this and reach the largest number of both technical and non-technical stakeholders, ADPC, through collaboration with the New Zealand Aid Programme (NZ Aid) began development of a web portal for easy dissemination of risk information for Myanmar in August of 2014. The portal has been developed using a structured spatial database, which can be expandable in all dimensions of data volume, types of hazards, sectors, and geographic areas etc. Users can access the risk information, customize them for specific applications, and generate maps and reports on interactive environment. The portal provides access to a hazard profile throughout the country; interactive web mapping and retrieval of spatially referenced risk information as a GIS repository; presentation of charts, graphs and statements; access to map products, reports and documents; along with risk assessment project information. Building upon both the technical risk assessment and the web portal, ADPC has begun to develop further activities and translate this technical data to be used by at risk communities. One such activity being the development of Early Warning Systems aimed to strengthen the capacity of local communities to effectively respond to hazard events like tsunamis/cyclones, landslides and floods. Ensuring that flood early warning systems are in place within local communities is an invaluable component of any DRR and flood mitigation program as the capacity and knowledge utilized by community members can be facilitated in a much faster way than structural mitigation techniques such as dikes, dams and seawalls, all of which can require years for financing, planning, implementation and maintenance. ADPC utilized several different inputs for an analysis aimed to identify sites for pilot activities of hazard prone communities in Rakhine State; notably the state level risk assessments conducted by UNDP, ADPC and the Myanmar Engineering Society, along with information from the rapid post disaster assessment of the flood and landslide events of July and August 2015 triggered by Cyclone Komen. For the purposes of the analysis, the most up to date report at the time of planning was Situation Report 2, released on 17 August 2015, as put out by the National Natural Disaster Management Committee in Myanmar. Using this methodology, specific village tracts in five townships (Maungdaw, Minbya, Myebon, Pauktaw and Sittwe) were identified as the areas to conduct pilot activities relating to strengthening early warning systems based on their need and location in risk prone areas. At the most local level (village tract) evacuation is ordered by the Village Tract Disaster Management Centers (VTDMCs) with a red color message and a specific public notification process. Practitioners took a lead in public outreach and dissemination by using megaphones (at cluster level), loud speakers and other modes of communication and made use of pre-developed evacuation maps, route plans, safe site plans and provisions to shelter local people to safer locations. See Figure 3. Methods for implementing early warning systems is something that has been well tested as an effective measure of reducing risk to vulnerable communities during times of floods and related hydro-meteorological hazards. One of the primary challenges however remains the ability to accurately locate appropriate communities to implement early warning training and other capacity building activities. As risk assessments conducted at the state and national levels remains a highly technical procedure, actors who conduct the risk assessments are often not associated with the decisions made from the final assessment. Therein lies the need to continue to develop improved ways of communicating risk information to ensure the best decisions for future project activities aimed for the greatest impact. The recent flood and storm events that impacted Rakhine State in July and August of 2015 provide clear indication that more work needs to be done in terms of empowering communities to develop early warning systems and translating risk information through web portals remains a proven way of accomplishing this. The model in Myanmar has already been derived from a successful case in Thailand where pilot sites for community based flood early warning systems were also informed from technical risk assessments and data obtained from an online platform. The Department of Disaster Prevention and Mitigation (DDPM) in Thailand developed a hazard database, which provides flood hazard map downloads (in PDF form) of for every province throughout the country. ADPC, working directly with DDPM utilized this information to select areas that were heavily affected during the 2011 flood events in Central Thailand as a component of the Office of Foreign Disaster Assistance from the United States Agency for International Development (USAID-OFDA) funded Program for Reduction of Vulnerability to Floods in Thailand. This initiative implemented a knowledge and information system that brought flood awareness to local administration and communities. Technical information relating to flood risk, gathered by government agencies including DDPM and the communities themselves —were identified and facilitated through a series of activities, which aimed to communicate and translate to support local end-to-end Early Warning System (EWS). These initiatives have brought technical information closer to communities in order to build their resilience towards floods in the future strengthened collaborative networks. The communication continued after success of ADPC trainings for “Mr. Warning”, a capacity building training for resource persons (e.g. Mr. Warning) who are responsible for providing early warning messages relating to flooding throughout communities in Central Thailand. The implementation of the Early Warning System also utilized accessible ICTs as locals utilized the mobile messaging application, Line to provide updates relating to flood early warning and weather forecast. This strengthened the connection between regional, provincial, local government officials and villagers to exchange information in a much faster way than before. See Figure 4 and Figure 5. As developing countries throughout Southeast Asia and the rest of the world continue to build upon their capacity to manage and distribute data, web portals and geospatial information will become more accessible. The first consideration is for countries to continue to produce adequate flood risk assessments, which provide a clear indication of the most at risk communities. As this information sets the baseline to develop future interventions for governments and NGOs, there continues to be a need to communicate this information to provide an understanding of site selection. 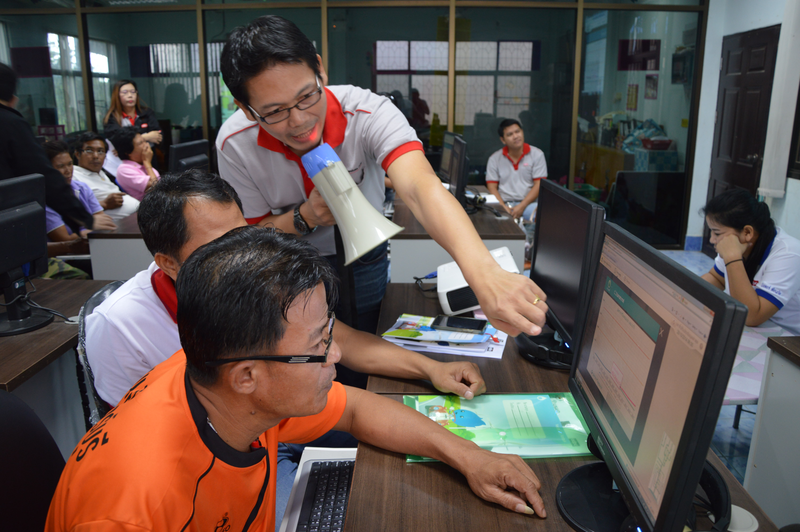 This is where online web platforms like those available in Myanmar and Thailand are invaluable to communicate flood risk information in a way that allows for accurate selection of areas in need of early warning systems. The “web-portal model” has proven to be a successful means of communicating flood risk information, however several challenges still remain in its management and future development. The server is still working on issues of hosting, in terms of consistency. The Relief and Resettlement Department (RRD) of Myanmar, the entity responsible for managing the server, has recently received support from UN HABITAT to strengthen the server speed and consistency. However, maintaining reliable access to these systems is something that may continue to be an issue throughout the country as both government and private sector are still working towards the development of more robust telecommunications and web platforms, along with energy supply. In regards to management, training of web content managers in Myanmar was conducted in preparation for the launch of the web-portal. As this level, utilizing web-portals for this role is relatively new within the country, notably in the role of government; it will take some time to monitor the overall success, as additional issues will emerge, in terms of updating data and continuing to provide relevant information. As the portal is a decision making tool, it is also important to consider the fact that flood risk management decisions will continue to evolve in Myanmar as there continues to be more investment both from the government, civil society and the international development community to strengthen flood risk. Decisions for identifying locations for early warning pilot activities may not remain one of the highest priorities as early warning capacity increases throughout the country in the coming years. Therefore, web-portal managers will need to keep well informed of the most pressing hazards related needs in terms of data management and communication. National Natural Disaster Management Committee – NNDMC (2015), Situation Report 2, 17 August 2015, Republic of the Union of Myanmar. United Nations Development Programme – UNDP and Asian Disaster Preparedness Center ADPC (2011), Multi-Hazard Risk Assessment in the Rakhine State of Myanmar: Final Report. UNDP, Yangon.